What does it mean for a friendship when one or both partners have self-critical or dependent traits? Do people act differently towards the other person, and does this in turn affect the relationship? The present research investigates this question by using the actor-partner interdependence model (APIM; Olsen & Kenny, 2006) to examine the effects of self-criticism and dependency on relationship quality in close friendship dyads and how these effects are mediated by support perceived to be available in the relationship. Self-criticism and dependency have been previously identified as two distinct depressive styles (Blatt & Zuroff, 1992). Self-criticism has been characterized by excessive concerns about achievements of high standards, harsh self-evaluations, and fears of disapproval and criticism from significant others. People who are high on dependency, on the other hand, exhibit excessive preoccupation with availability of love, nurturance, and support, are afraid of abandonment, and have difficulty functioning alone. (Baltt & Zuroff, 1992). Both of these personality styles have been linked to greater depression in a variety of studies, as well as to other negative outcomes (Zuroff, Sanor & Mongrain, 200). Research on dependency and self-criticism in relational contexts has shown that self-critics have negative relational schemas such that they have negative expectations in relationships, including expectations of being hurt by others, and so are more distrustful of romantic partners and report more dissatisfaction in the relationship and more generally with the social support they receive (Zuroff & Ducan, 1999). At the same time, they are less agreeable, and come across as more hostile to others. In contrast, those high on trait dependency can actually be quite pleasant relational partners because they are acutely attuned to issues of intimacy and display more communal behaviour. They seek out interactions with others, and likely as a result actually experience greater social support. They are also more agreeable in general, and engage in more submissive behaviour. As a result, self-critics are usually found to have worse relationship outcomes, while dependents often have positive relationship outcomes (see Zuroff, Sanor & Mongrain, 2005 for a review). However, most of the studies are conducted in the context of romantic relationships, and often only look at the personality, or the outcome, of one relationship partner. One exception to this was a study of roommates (Mongrain, Lubbers, & Struthers, 2004), which showed that self-critics were more likely and dependents less likely to be rejected by their roommates. Although in that study ratings were obtained from both roommates, there was minimal interdependence and the data were treated as independent, precluding dyadic analyses which take into account both people’s personalities. In the present research, we were interested in looking at pairs of female friends, and examining how both partners’ personalities influenced relationship outcomes. We were also interested in how this process is affected by friends’ interactions with each other. Drawing on concepts from self-determination theory (Deci & Ryan, 2000), we focused on the friends’ interpersonal orientations, the extent to which a person is autonomy-supportive or controlling towards others. Autonomy supportive behaviours include acknowledging the other’s perspective, providing choice, encouraging self-initiation and generally being responsive to the other person. Although they are often well-meaning, someone with a controlling orientation, on the other hand, is more likely to try to impose their ideas on the other person, providing suggestions or even pressuring them (e.g., “I have a great idea for how you can improve your diet.”). Previous research has shown that both receiving autonomy support from another person and providing autonomy support enhance the relationship (Deci, La Guardia, Moller, scheiner & Ryan, 2006). Although the precursors of interpersonal orientations have received limited attention, we thought that self-critical and dependent personality traits might play a particularly important role in a dyadic context. First, the perception of autonomy support versus controllingness from another person is subjective, and as such might be influenced by personality traits. Secondly, based on research suggesting that people can pull for autonomy supportive or controlling behaviour from others, personality styles might influence the type of behaviours elicited from close friends - for example, a person who is very self-critical might evoke less support from others, while someone who is dependent might elicit more support. The present study thus focused on the effects of both one’s own and one’s friends’ self-criticism and dependency on friendship quality. We hypothesized that both being self-critical and having a self-critical friend would result in decreased relationship quality over the course of 3 months, while both being dependent and having a dependent friend would be positively related to relationship quality. Additionally, we investigated the role of autonomy support and controllingness as mediators, as we expected that self-criticism and dependency would affect both behaviours (how autonomy supportive or controlling a person is towards their friend), and perceptions (the extent to which a person perceives their friend’s behaviour as autonomy supportive or controlling). Specifically, we expected that a self-critical friend would be perceived as less autonomy supportive, while a dependent friend would be perceived as less controlling. Additionally, one’s own self-criticism would lead the person to perceive the other as less autonomy supportive, while dependency might lead to the friend being more controlling resulting in a perception of the other as more controlling. Finally, perceived autonomy support would lead to greater relationship satisfaction, while perceived controllingness would lead to worse relationship outcomes. This research was conducted in the context of a larger study on goal progress and friendships. We were interested in how female friends interact with each other to support each other in pursuing personally important goals. One hundred and five pairs of female friends (N=210; all university students) participated in the study. Participants completed a battery of questionnaires at the start of the winter semester which included a shortened version of the DEQ (Blatt, D’Affliti, & Quinlan, 1976) to measure self-criticism and dependency, as well as relationship measures including relationship closeness, affect experienced in the relationship when they are with their friend, and their investment in the relationship. They were asked to think about three goals they are planning to pursue throughout the semester, and to share their goals with their friend (in the lab session). Twice during the semester, at monthly intervals, participants completed an online questionnaire which included a measure of autonomy supportive and controlling support (Koestner et al., 2012). Finally, at the end of the semester, participants again reported on the state of their relationship including the same measures as at the initial assessment. All measures were completed using 7-point likert scales. Preliminary analyses showed that participants typically rated their friends as autonomy supportive (M = 5.1, SD = .90) and not particularly controlling (M = 2.1, SD = .95). Participants also reported high relationship quality (means for the three indicator variables ranging from 5.6 to 6.1 at T1), which diminished throughout the semester (means from 5.3 to 5.6 at final follow-up). Self-criticism and dependency were highly correlated (r = .63, p < .01), leading us to include both variables simultaneously in all analyses. Correlations between the partners showed that female friends are similar to each other on the self-criticism dimension (r = .23, p <.01) and virtually independent on the dependency dimension (r =.05, ns). Additionally, both friends’ perceptions of autonomy support were correlated, (r = .44, p < .01) but perceptions of controllingness were not (r = .07, n.s. ), so that female friends are similar to each other in terms of the amount of autonomy support they experience in the relationship but not in the amount of control. Finally, both partners’ ratings of relationship quality were correlated, rs ranging from .20-.58 across the three measures at both times, all ps < .01. Main analyses were conducted using the Actor-Partner Interdependence model (APIM) for indistinguishable dyads for structural equation modeling (Olsen & Kenney, 2006; Ledermann, Macho & Kenney, 2011). Each friend’s self-criticism and dependency was entered as predictor variables. A latent variable of relationship quality composed of closeness, positive affect, and investment (for each partner) served as the outcome variable. We controlled for a similar latent variable of relationship quality at the initial assessment in all analyses, such that the results represent changes in relationship quality over a three-month period. Figure 1 illustrates the full SEM model of the main analyses (without mediators). Since there was no way to identify one person as the actor and the other as the partner, the dyads are considered indistinguishable and the paths in the model are constrained in such a way that the actor effects (e.g. effects of one’s own self-criticism on relationship quality for person A and person B) are set to equal each other, and the partner effects (e.g. effects of person As’ self-criticism on person B’s relationship quality, and vice versa) equal each other. Figure 1. Illustration of full APIM model. Blue squares and lines represent actor effects; green squares and lines represent partner effects. Critical = self-criticism; Depend = dependency; Rel Qualt = Relationship Quality. Covariance paths between all Time 1 variables (relationship quality, self-criticism, dependency) were included in the model but were removed from the figure for presentation purposes. Results from the first model showed that both one’s own and the friend’s self-criticism were negatively related to relationship quality (β = -.12, p <.05 and β = -.29, p <.01 for actor and partner effects of self-criticism, respectively). Friend’s dependency was significantly positively related to improved relationship outcomes (partner effect β = 14, p<.05), while a person’s own dependency was unrelated to relationship quality (actor effect β = 08, ns). Results from the mediation model are illustrated in Figure 2. Both actor and partner self-criticism were negatively related to autonomy support (β = -.17, p <.01 and β = -.13, p <.05 for actor and partner effects, respectively), while partner’s self-criticism was positively related to perceptions of control (such that people who are self-critical are perceived by their friends as more controlling, β = -.13, p <.05). Dependency in both friends was unrelated to autonomy support but was differentially related to perceptions of control, such that dependent people perceived their friends as more controlling (β = .22, p <.01) but were perceived by the other person as less controlling β = -18, p <.01). Figure 2: Results from mediation analyses. 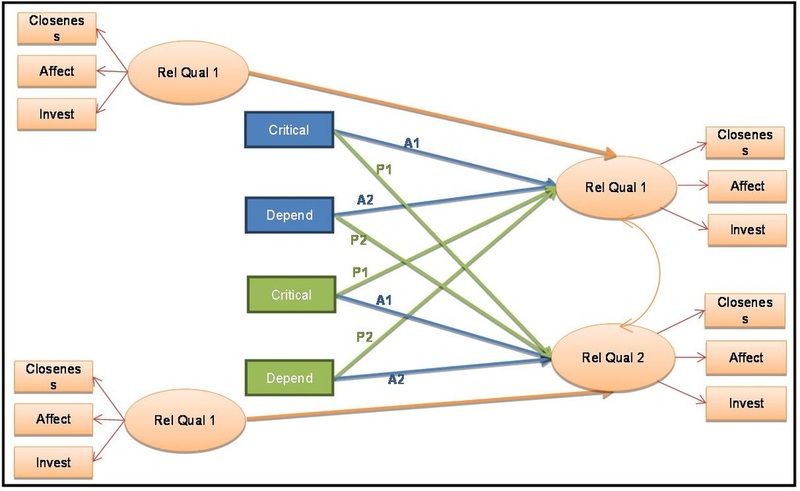 Only the relevant part of the overall model is presented here; full analyses included both partner’s relationship quality and controlled for relationship quality at time 1. Blue squares and lines represent actor effects; green squares and lines represent partner effects. Dashed arrows represent the direct effects from the independent variables on the dependent variable once the mediators are included in the model. Critical = self-criticism; Depend = dependency; Aut-Sup= autonomy supportive; Control = controllingness; Rel Qualt = relationship quality. Standardized coefficients are reported. †p<.10; *p<.05; **p<.01. As expected by self-determination theory, relationship outcomes were influenced by both actor and partner perceptions of autonomy support and control. Perceiving one’s friend as autonomy supportive had an especially strong positive effect on relationship quality (β = .51, p <.01), while perceiving one’s friend as controlling had a negative effect (β = -.25, p <.01). Being perceived by the other person as autonomy supportive was positively related to relationship quality (β = .10, p <.05), and a similar effect was found for being perceived as controlling, although this result was marginal (β = .07, p =.07). Table 1 presents the significant direct and indirect effects from the full mediation model. Results of the mediation analyses showed that while interpersonal orientations were significant mediators of the effects of both one’s own and the partner’s self-criticism and dependency, the direct effects remained important. Notably, the results for the effect of actor dependency on relationship satisfaction reveal a suppression effect, where dependency plays both a direct positive role and an indirect negative role on relationship satisfaction, such that people who are dependent rate their relationship more highly, but also rate their friends as more controlling, which decreases relationship quality. Overall, this research shows that self-criticism and dependency of both people in a friendship affect the quality of the relationship. Both one’s own and the friend’s self-criticism lead to a decrease in relationship quality over the semester, while dependency has mixed results. Specifically, although the direct effects of dependency on the relationship are positive, there are negative indirect effects – dependent women experience being more controlled by others, which inadvertently worsens their relationship. This is in line with prior research which has found inconsistent results for dependency on both relational and general adjustment outcomes. The overall effects of self-criticism and dependency were partially mediated by autonomy-support and controllingness, such that women who had a self-critical partner or were self-critical themselves reported lower relationship quality partially because they experienced less autonomy-support from their friend. Similarly, dependent women’s greater perceptions of being controlled by their friend negatively impacted relationship quality, while having a dependent friend made one feel less controlled, leading to a better relationship. A particularly interesting finding was that self-criticism and dependency of both partners influence people’s reports of their friends’ autonomy supportive and controlling behaviours. This could be due to how people actually behave in the context of the friendship, how they perceive the other person, or the type of behaviours they elicit from the other person. Self-critical women report that they receive less autonomy support from their friend, suggesting either that they are not seeing even potentially supportive behaviours as such, or that they are so critical on themselves that it is difficult for their friend to actually behave in an autonomy supportive way towards them. Also, friends of self-critical women report receiving less autonomy support, suggesting that people who are self-critical are not autonomy-supportive towards their friends. In contrast, dependent women are viewed by their friends as less controlling, supporting prior research showing that dependent women are more agreeable and submissive. However, dependent women did view their friends as more controlling, which may reflect that dependent people elicit a specific reaction from close others – if you are always asking to be taken care of, others may end up doing it in non-optimal ways. This distinction between provision and perceptions of support is especially interesting, and we are currently investigating it in further studies. Preliminary data suggests that people’s perceptions of support received correlate at only about .30 with their friend’s reports of support provided; we are currently looking further into these data to better understand this disconnect between people’s perceptions of the support they are providing and their friend’s perceptions of the support received. Blatt, S.J., & Zuroff, D.C. (1992). Interpersonal relatedness and self-definition: Two prototypes for depression. Clinical Psychology Review, 12, 527-562. Blatt, S.J., D’Afflitti, J.P., & Quinlan, D.M. (1976). Experiences of depression in normal young adults. Journal of Abnormal Psychology, 85(4), 383-389. Deci E. L., La Guardia J. G., Moller A. C., Scheiner M. J., & Ryan R. M. (2006). On the benefits of giving as well as receiving autonomy support: Mutuality in close friendships. Personality and Social Psychology Bulletin, 32, 313–327. Ledermann, T., Macho, S., & Kenny, D. (2011). Assessing Mediation in Dyadic Data Using the Actor-Partner Interdependence Model. Structural Equation Modeling: A Multidisciplinary Journal, 18, 595-612. Mongrain, M., Lubbers, R. and Struthers, W. (2004). The Power of Love: Mediation of Rejection in Roommate Relationships of Dependents and Self-Critics. Personality and Social Psychology Bulletin, 30, 94-105. Olsen, J. A., & Kenny, D. A. (2006). Structural equation modeling with interchangeable dyads. Psychological Methods, 11, 127–141. Zuroff, D. C., & Duncan, N. (1999). Self-criticism and conflict resolution in romantic couples. Canadian Journal of Behavioural Science, 31, 137-149. Zuroff, D. C., Santor, D. A., & Mongrain, M. (2005). Dependency, self-criticism, and maladjustment. In J. S. Auerbach, K. J. Levy, & C. E. Schaffer (Eds. ), Relatedness, self-definition and mental representation: Essays in honor of Sidney J. Blatt. London: Brunner-Routledge.